INTRODUCTION: There has been a growing interest in swine as animal models for regenerative medicine, because of their organ physiology, size, biomechanics and genetic characteristics being similar to humans. Swine-derived stem cells will be critical to test the efficacy of autologous/allogeneic cell therapy strategies in this clinically relevant animal model. BACKGROUND: We have previously isolated, characterized and investigated the reparative potential of a homogeneous subpopulation of human bone marrow-derived mesenchymal stromal cells, named marrow-isolated adult multilineage inducible (MIAMI) cells. AIM: The goal of this study was to isolate MIAMI cells from swine bone marrow with characteristics similar to their human counterparts. MATERIALS AND METHODS: Swine whole BM was obtained through iliac crest aspiration from 3-11 months old Yorkshire pigs. Whole BM cells, including adherent and non-adherent cells, were plated and incubated in a low oxygen tension environment (3% O2). SwMIAMI cells were cultured up to 40% confluence before splitting. The obtained cells were characterized by RT-qPCR, flow cytometry and immunocytochemistry. We assessed their potential to differentiate into cells of various lineage, as well as their response to oxygen tension. RESULTS: Expression of the key embryonic stem cell markers Nanog, Sox-2, Oct4a and the SSEA-1 synthase was confirmed using RT-qPCR. Expression of these markers was significantly higher on cells grown at 3% O2. Swine MIAMI cells (swMIAMI) expressed CD29, CD44, CD49e, CD54, CD63, CD81, CD90, and CD122, while they were negative for CD34, CD45, MHC-Class I, and MHC-Class II. Swine cells were able to efficiently differentiate into adipocytes, osteoblasts, chondrocytes, endothelial and also neuronal-like cells. Finally, they appeared larger and proliferated less at 21% O2 compared to 3% O2, and expressed MHC-I only when cultured at 21% O2. DISCUSSION: These swMIAMI cells will facilitate the development of preclinical animal studies more closely related to humans, thereby enhancing the safety of future clinical trials. CONCLUSIONS: We therefore successfully isolated from swine bone marrow cells sharing the hallmarks of the human MIAMI cells previously described. The use of adult stem cells for regenerative/reparative medicine and immune-mediated disorders is very attractive and promising because most adult cells can easily be isolated from patients/donors, expanded to high numbers, and used for the treatment of numerous diseases 1. Therefore, stem cell therapy is opening new avenues for basic and clinical research. In postnatal life, bone marrow (BM) represents the major source of multipotent stem cells 2. It contains the well-characterized hematopoietic stem cells (HSCs), and the multipotent mesenchymal stromal cells (MSCs) capable of multilineage differentiation, predominantly toward the mesenchymal lineages 3 , 4 , 5 , 6 , 7 , 8 but also toward the endodermal and ectodermal lineages 9 , 10. Furthermore, MSCs have recently been studied for their immunomodulatory property in vitro and in vivo 11 , 12, which can make them useful for several immune-mediated disorders 13. The presence of non-hematopoietic stem cells in the BM was first suggested almost 150 years ago by the German pathologist Julius Friedrich Cohnheim in the context of wound repair studies 14. Then, one hundred years later, Friedenstein et al. described them for the first time as a fibroblast-like cell population 15. MSCs represent a small percentage (0.01%) of mononuclear cells from whole BM 16 and can be easily isolated from BM of many species, including humans 17, non-human primate 18, rodent 19 , 20, canine 21, leporine 22, feline 23, swine 24, ovine 25, caprine 26, bovine 27, ailuropodinae 28, and equine 29, and further expanded in large numbers in vitro. Even though a variety of markers have been used to isolate and/or characterize them, MSCs represent a heterogeneous population of uncommitted pluripotent stem cells as well as lineage-committed progenitor stem cells 30 , 31. Typically, human MSCs are characterized by a combination of the positive markers CD73, CD90, CD105, and negative markers CD11b, CD14, CD19, CD34, CD45, CD79a, and HLA-DR 32 , 33. However, characterizing cells using these clusters of differentiation (CD) markers is a difficult task in some species due to the unavailability of swine-specific antibodies. 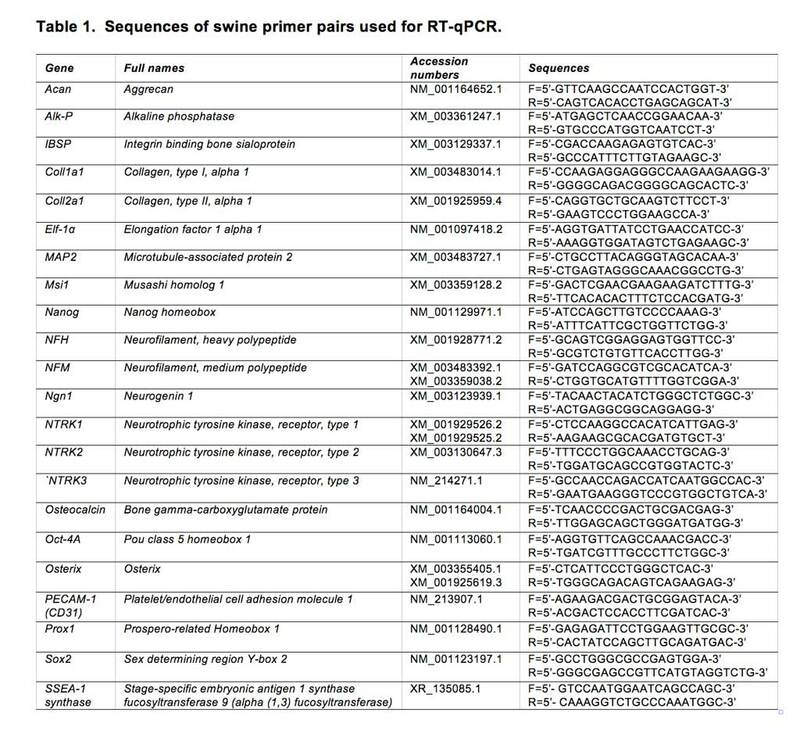 For example, expression of CD markers in swine MSCs has yet to be fully characterized. Our group previously isolated a highly homogeneous population of primitive cells from adult human BM, the marrow-isolated adult multilineage inducible (MIAMI) cells 34, that have the capacity to differentiate in vitro in response to specific physiological molecular cues toward cell lineages in all three embryonic germ layers 35 , 36. In vivo, we demonstrated that human MIAMI cells are able to protect/repair tissues in the context of many disorders, including peripheral vascular ischemia, stroke, and Parkinson’s disease 37 , 38 , 39. To ensure the expected short and long term safety and efficacy of MSCs or MIAMI cell therapy, adequate preclinical trials need to be performed before translation into human applications. With that goal in mind, preclinical studies on larger animal models represent a great tool to test the efficacy of cell therapy, most studies being usually performed on mice or rats. Rodents-based studies often suffers from a poor translation to human disorders 40 , 41 , 42, because of the differences in the physiology, molecular pathways, and size of the animals. There has been a growing interest in the swine as an animal model to study stem cell based therapy and transplantation for regenerative/reparative medicine 43. Indeed, swine organ physiology, size and genetic characteristics are very close to those of humans 44 and their biomechanics also makes them a very suitable animal model for various orthopedic conditions, such as knee cartilage repair 45 , 46 , 47. Because of these similarities with humans, many efforts are also being made to produce genetically engineered ‘‘humanized’’ porcine organs for transplantation 48 , 49. In the context of cell therapy studies, the use of stem cells of swine origin will be of tremendous importance to test the efficacy of autologous/allogeneic cell therapy strategies in swine animal models, compared to xenograft-based studies using cells from rodent or human origins. The aim of this study was to isolate and characterize swine bone marrow derived MIAMI (swMIAMI) cells, thereby allowing the future development of safer preclinical animal studies more closely related to humans. We hypothesized that swMIAMI cells could be easily isolated and expanded from bone marrow iliac crest aspirate using a unique expansion selection procedure previously developed for humans 50. The obtained swMIAMI cells were characterized by the use of RT-qPCR, flow cytometry, and immunocytochemistry. We also investigated their capacity to differentiate into osteoblast, chondrocytes, adipocytes, endothelial and neural cells in vitro, as well as their response to various oxygen tensions 51. Reagents. DMEM-low glucose (DMEM-LG), DMEM-high glucose (DMEM-HG), F-12 medium, α-MEM, 0.25% trypsin-EDTA, phosphate-buffered saline (PBS),TRIZOL, HEPES, RNAqueous-4PCR kit, and penicillin/streptomycin were from Invitrogen (Carlsbad, CA, USA). Fetal bovine serum (FBS) was fromHyClone (Logan, UT, USA). Ascorbic acid 2-phosphate, hydrocortisone, trypan blue, fibronectin, alizarin red-sulfate (AR-S), Alcian blue and fast red were from Sigma Chemical (St. Louis, MO, USA). ITS-plus was from Collaborative Biomedical Products (Bedford, MA, USA). High Capacity cDNA Reverse Transcription Kit was from Applied Biosystems (Carlsbad, CA, USA). The following human antibodies were used for flow cytometry analysis: CD29 PE, CD34 FITC, CD45 FITC, CD49e PE, CD54 PE, CD63 FITC, CD81 PE, and CD90 FITC, CD122 FITC, and SSEA-4 PE from R&D System (Minneapolis, MN); MHC-I and MHC-II from VMRD, Inc. (Pullman, WA, USA). The following primary antibodies were used for immunofluorescence – CD31 and neurofilament-M (NF-M) from Santa Cruz Biotechnology (Santa Cruz, CA, USA); Oct-4a from Abcam (Cambridge, MA, USA).Alexa Fluor 488 from Invitrogen was used as secondary antibody. Vectastain Elite ABC immunoperoxidase, Peroxidase Kit, Biotinylated anti-mouse IgG, anti-rabbit IgG, anti-goat, and mounting solution with DAPI from Vector Laboratories (Burlingame, CA, USA). Basic-fibroblast growth factor (b-FGF), vascular endothelial growth factor (VEGF), epidermal growth factor (EGF), insulin-like growth factor-1 (IGF-1), valproic acid, forskolin, hydrocortisone, KCl, rolipram, Insulin, butylated hydroxyanisole (BHA), naphthol AS-TR phosphate, n-n′ dimethylformamide, fast blue BB salt, Triton X-100, BSA, isobutylmethylxanthine, indomethacine, Sudan IV, and ß-Mercaptoethanol (ß-ME) were from Sigma. Matrigel Basement Membrane Matrix was from BD Bioscience (San Jose, CA, USA). Neurotrophin-3 (NT-3), nerve growth factor (NGF), and brain derived neurotrophic factor (BDNF) were from Preprotech (Rocky Hill, NJ, USA). All animals received humane care and surgical procedures were in compliance with the “Guide for the Care and Use of Laboratory Animals” 52. Swine whole BM was obtained through iliac crest aspiration from 3-11 months old Yorkshire pigs. Swine were placed under general anesthesia; a BM aspiration needle with stylet was inserted into the dorsal aspect of the tuber coxae. The stylet was removed and 20 ml of BM was collected with a syringe containing 100 U/ml heparin. The isolation method of swMIAMI cells was similar to the human method previously described Pfaffl MW. A new mathematical model for relative quantification in real-time RT-PCR. Nucleic Acids Res 2001; 29(9): e45., with some specific modifications. Briefly, whole BM cells, including adherent and non-adherent cells, were plated at a density of 1.0×105 cells/cm2 in 10 ng/ml fibronectin-coated T-75 flasks (Nunc, Roskilde, Denmark) in the presence of DMEM-LG with 5% FBS (previously screened for optimal cell growth), 100 U/ml penicillin and 100 µg/ml streptomycin (P/S), 100 µM ascorbic acid 2-phosphate (expansion medium). Bone marrow nucleated cells were counted with a hemacytometer using 2% acetic acid (to lyse red blood cells) and 0.4% trypan blue (for dead cells exclusion). Cells were incubated in a tri-gas incubator in a 100% humidified atmosphere of 3% O2, 5% CO2, and 92% N2 (low oxygen tension). The whole culture medium was changed after one week; thereafter, half of the culture medium was replaced twice a week. SwMIAMI cells were cultured up to 40% confluence before splitting. For expansion, swMIAMI cells were re-plated at 100 cells/cm2 in expansion medium at low oxygen tension and one half of the medium was changed twice a week. In the present study, we only used swMIAMI cells from passages 2 to 4. To identify the optimal growth conditions, swMIAMI cells were plated at 500 cell/cm2 in 6-well plates in triplicate at 3% or 21% O2 in the presence of expansion medium. At 3, 7, and 10 days, cells were rinsed twice with PBS, detached with 0.05% trypsin-EDTA, and then counted manually with a hemacytometer. Undifferentiated swMIAMI cells were plated in triplicate on T-75 flasks in the presence of expansion medium. Five days later cells were trypsinized and 1.0×105 cells were aliquoted into FACS tubes. Cells were rinsed twice with a cold FACS buffer solution (D-PBS, 0.5% BSA at pH 7.4) and then stained with the following antibodies: CD29, CD 34, CD45, CD49e, CD54, CD63, CD73, CD81, CD90, CD105, CD122, SSEA-4, MHC-I and MHC-II. Cells were incubated for 30 min at 4°C. At the end of the incubation time, cells were rinsed three times with cold FACS buffer solution, fixed with 1% paraformaldehyde, and then rinsed again three times with cold FACS buffer until analysis with FACScan or Accuri C6 (BD Bioscience). Total RNA was isolated from the cells using TRIZOL reagent or RNAqueous-4PCR kit according to manufacturer’s specifications. Total RNA was quantified on the Nanodrop ND-1000 Spectrophotometer (Thermo Scientific, Wilmington, DE, USA). Only RNA with a 260/280 ratio in the range of 1.9-2.0 was used for PCR analysis. Reverse transcription of 2 µg total RNA to cDNA was prepared with random hexamer primers using the High Capacity cDNA Reverse Transcription Kit. For semi-quantitative RT-PCR, a final concentration of 40 ng cDNA and 10 pmol of 5′ and 3′ primers in a standard PCR buffer were utilized. For RT-qPCR, a final concentration of 100 ng cDNA and of 160 nM forward and reverse primer pairs were used. Quantitative RT-PCR was performed with an Mx3005P instrument (Stratagene, La Jolla, CA, USA) for 40 cycles (95°C/30 sec; 58°C/30 sec; 72°C/15 sec) after an initial denaturation of 94°C/2 min. Each product was confirmed for the expected size by agarose gel electrophoresis. Crossing point values from logarithmic amplification profiles for target genes were divided by values from the ELF-1α reference gene from RNA samples and presented as fold above control treated cells analyzed from 3-4 independent experiments. The fluorescence data were analyzed with the Mx3005p v2.02 Build 268 software. Results were exported to Microsoft Excel for analysis. All of the corresponding RT-qPCR data was analyzed using the ∆∆CP method 53 and normalized against one negative control and ELF-1α. The control sample was set to a value of one in all cases and error bars are displayed at standard deviation. Runs were done in triplicate and each experiment was repeated three times. The DNA oligonucleotide sequences used for RT-qPCR are given in Table 1. For immunocytochemistry, cells were fixed with 4% paraformaldehyde at 4°C for 10 minutes and permeabilized with 0.1% Triton X-100 for 5 minutes. Blocking and diluent solution consisted of PBS, 1% BSA. Fixed cells were blocked for 30 minutes, incubated sequentially 1 hour with the primary antibody anti-Oct4a, MHC class I, MHC class II, or NFM followed by 1 hour incubation of the fluorescein- or rhodamine-conjugated secondary antigoat IgG antibody. Between each step, slides were rinsed with PBS with 0.3% BSA. Specific immunostaining was demonstrated in control experiments in which cells were exposed to primary isotypic antibodies and then incubated with conjugated antibodies. Mounting solution containing DAPI was used. Color images were captured using a Nikon fluorescence microscope. SwMIAMI cells were plated at 4,000 cells/cm2 in 6-well plates in α-MEM, 10% FBS with P/S, 100 µM ascorbic acid 2-phosphate, 10 mM β-glycerolphosphate, and 10 nM dexamethasone (osteogenic medium), in a 100% humidified atmosphere of 21% O2, 5% CO2, at 37°C. Medium was changed twice a week. Cells were cultured for a total of three weeks. At the end of the three weeks, swMIAMI cells were rinsed with PBS twice, fixed with a solution of 2% cold-buffered formaldehyde and 0.2% glutaraldehyde for 30 min at 4°C, rinsed with distilled H2O twice, and then stained for alkaline phosphatase. Briefly, 8 mg of naphthol AS-TR phosphate was dissolved in 0.3 ml of n-n′ dimethylformamide. Simultaneously, 24 mg of fast blue BB salt was dissolved in 30 ml of 100 mM Tris-HCl, pH 9.6. These two solutions were mixed, 10 mg of MgCl2 was added, and then the pH was adjusted to 9.0 with 1 N HCl. The final solution was filtered through a 0.2-μm filter. Cells were incubated at 37°C for 30 min, rinsed extensively with distilled H2O, and photographed. The ability of swMIAMI cells to form a mineralized extracellular matrix (ECM) in vitro was measured as previously described 54. Briefly, at the end of the incubation time, 3 weeks, cells were rinsed thrice with PBS at room temperature and fixed with ice-cold 70% ethanol for 30 min at 4°C. Subsequently, cells were rinsed with distilled H2O three times. Cells were stained with 40 mM alizarin red-sulfate, pH 4.2, for 10 min at room temperature using an orbital shaker (100 rpm). Non-specifically bound stain was rinsed away during five changes of ultrapure H2O and one rinse for 15 min with PBS at room temperature. ECM mineral-bound stained nodules were photographed using inverted light microscopy. For adipogenic differentiation, cells were plated at 5,000 cells/cm2 in 6-well plates. The Chemicon adipocyte differentiation kit was used following the manufacturer’s recommendations. Cells were incubated for three weeks in a 100% humidified atmosphere of 21% O2, 5% CO2, at 37°C. At the end of the incubation time, cells were rinsed three times with PBS and fixed in 2% formaldehyde, 0.2% glutaraldehyde for 30 min at 4°C. Lipid droplets were stained using a 3% solution of oil red O in isopropyl alcohol/water (3:2) 55. For chondrogenic differentiation, cells were trypsinized, rinsed in serum-containing medium, and resuspended in serum-free chondrogenic medium composed of DMEM-HG, 100 nM dexamethasone, 10 ng/ml TGF-β3, 50 µg/ml ascorbic acid 2-phosphate, 100 µg/ml sodium pyruvate, 40 µg/ml proline, ITS-plus (chondrogenic differentiation medium) and P/S 56. Aliquots of 2.5 x 105 cells were suspended in 0.5 ml of chondrogenic medium and distributed to 15-ml conical polypropylene centrifuge tubes. The cells were centrifuged for 5 min at 400 g and then left at the bottom of the tube. Tubes were incubated, with caps loosened, in a 100% humidified atmosphere of 95% air, 5% CO2, at 37°C for up to four weeks. The medium was changed twice a week. Deposition of extracellular matrix proteins was examined by histological staining. Pellets were fixed in 10% neutral buffered formalin for 2 hr. at 4°C and then in 4% paraformaldehyde for 15 min at room temperature, respectively. After rinsing in PBS, the specimens were dehydrated in a graded series of increasing concentrations of ethanol, cleaned with xylene, embedded in paraffin, and cut into 5 µm sections. Proteoglycans were detected by staining sections with Alcian blue solution and nuclei with Fast red 57. Vascular endothelial differentiation was performed as previously described 58. Briefly, cells were plated at 2×104 cells/cm2 in 6-well plates in expansion medium without FBS and supplemented either with 100 ng/ml VEGF or with a growth factor cocktail (GFC, 100 ng/ml VEGF, 10 ng/ml bFGF, 10 ng/ml EGF, 10 ng/ml IGF-1, and 100 nM hydrocortisone) in a 100% humidified atmosphere of 21% O2, 5% CO2, at 37°C; medium was changed every 5 days. Cells were harvested after 21 days in culture. The platelet endothelial cell adhesion molecule-1 (PECAM-1 or CD31) expression was evaluated by immunofluorescence, as described previously 59. The expression of CD31 was also evaluated by RT-qPCR. The DNA oligonucleotide sequences used for RT-qPCR are given in Table 1. SwMIAMI cells were cultured for 21 days in the presence of GFC medium, and then cells were trypsinized and plated into 6-well plates (1.0×104 cells/well) coated with a thin layer of Matrigel solution. Vascular tube-like network formation was observed with an inverted microscope after 7 hours. For neural induction the protocol for human MIAMI cells was used 60, with some modification for swMIAMI cells. Briefly, cells were plated at 3,000 cells/cm2 in 10 ng/ml fibronectin-coated T-75 flasks inDMEM-HG/F12, 20% FBS with 100 U/ml penicillin and 1 mg/ml streptomycinfor 24 hours. Neural specification (step 1) was induced by exposingcells to DMEM-HG/F12 medium, 20% FBS, 10 ng/ml bFGF for 24 h. At theend of the neural specification treatment cells were rinsedthree times with PBS and then neural commitment (step 2) wasinduced by exposing the cells to 1 mM b-ME, and 30 ng/ml NT-3 in DMEM-HG/F12 for 72 h. Finally, neural differentiation(step 3) was induced by first rinsing cells three timeswith PBS and then exposing them to 30 ng/ml NT-3, 10ng/ml NGF and 30 ng/ml BDNF, 5 mM HEPES, 2 mM valproic acid, 4 μM forskolin, 1 μM hydrocortisone, 25 mM KCl, 10 mM rolipram, 5 μg/ml insulin, 100 μM BHA, in DMEM-HG/F12 with 1% FBS for 3-7 days. Neural differentiation was assessed by the expression of the following genes, neutrophin receptors: NTRK1, NTRK2, NTRK3; neurofilaments: NFM, NFH, MAP2; neural precursor maintenance: Musashi; pro-neural transcription factors: Ngn1, Prox1. See Table 1 for primers used. Immunofluorescence was performed as described in a previous section, and fetal brain-derived human neuroepithelial progenitor cells 61 were used as positive controls. All quantitative data are expressed as mean of triplicated experiments ± SD. Statistical analysis was performed using one-way ANOVA followed by Newman-Keuls post-hoc multiple comparison test. Values of p < 0.05, p < 0.01 and p < 0.001 were considered statistically significant and noted *, **, and *** respectively. Cell selectionwas based on the capacity of the cells to proliferate underspecific conditions of low oxygen tension, ECM substratum, platingdensity and co-culture with non-adherent cells 62. We optimized our unique isolationand culture conditions for swMIAMI cells, which resulted in the selection/expansion ofa population of cells with small cytoplasm (Figure 1A, B) with a high proliferative capacity. 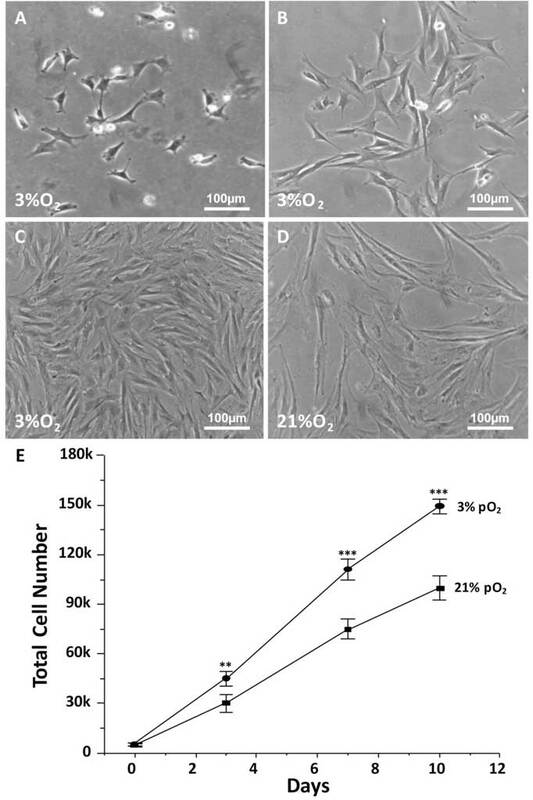 SwMIAMI cells grown at low oxygen tension (3% O2) appeared smaller in size and in higher numbers when compared to the oxygen tension normally used for in vitrocell cultures (21% O2) (Figure 1C-E). Figure 1. SwMIAMI cells are small and proliferate faster in a low oxygen environment. SwMIAMI cells were expanded at low-density (100 cells/cm2) in a low oxygen environment (3% O2) and in 21% O2 for up to 10 days. Cell morphology at 3 days (A) and 7 days (B) at 3% O2. Comparison of cell morphology between 3% O2 (C) versus 21% O2 (D) after 10 days. Cell counts were performed to determine the proliferation rates of swMIAMI cells, demonstrating increased cell numbers at 3% O2 versus 21% O2 (E). Each point and error bar represent the mean ± SD for triplicate determinations; **p < 0.01; ***p < 0.001 compared to 21% O2. After expansion, swMIAMI cells were analyzed by RT-qPCR, flow cytometry analysis, and immunofluorescence. 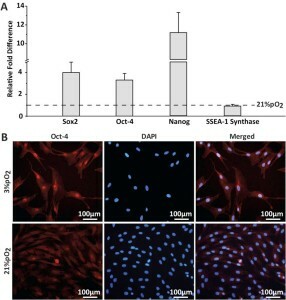 RT-qPCR analysis showed the expression of the pluripotency and stem cell markers Nanog, Sox-2, Oct4a, and stage specific embryonic antigen-1 (SSEA-1) synthase at the mRNA level that remained at a constant level of expression under both oxygen conditions (Figure 2A). Expression of those markers was significantly higher in cells grown at 3% O2 compared to 21% O2 except for SSEA-1 synthase (Figure 2A). SSEA-1 (as well as SSEA-4) is a carbohydrate associated with lacto- and globo-series glycolipids. Therefore, we analyzed by RT-qPCR the enzymes responsible for these molecules synthesis, SSEA-1 and SSEA-4 synthases, respectively. Expression of Oct4a was also confirmed by immunofluorescence (Figure 2B). Figure 2. SwMIAMI cells express key pluripotency/stem cell markers. Real-time quantitative PCR (RT-qPCR) was used to determine expression of key pluripotency and stem cell markers (Sox-2, Oct-4, Nanog, & SSEA-1 synthase), demonstrating increased expression at 3% O2 for all except SSEA-1 synthase (A). Immunofluorescence staining demonstrated nuclear localization of Oct-4a (B). The data shown are representative of three experiments. Results are expressed as mean ± SD of triplicates. ***p < 0.001 compared to 21% O2. 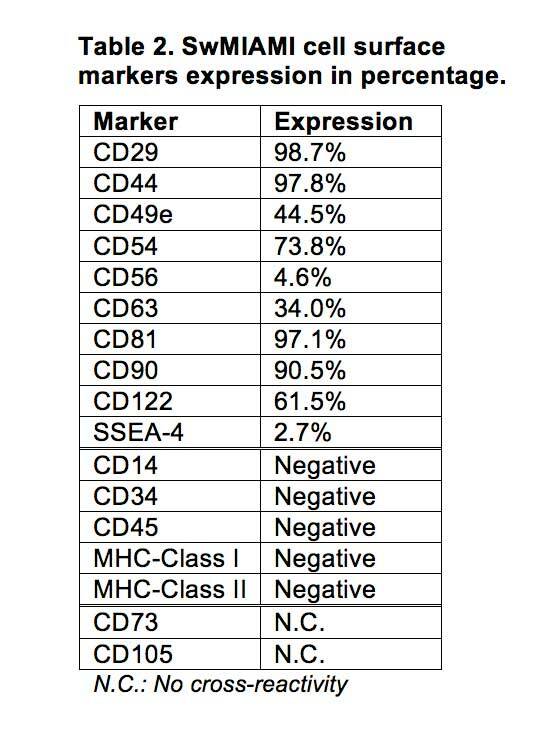 Because of the lack of swine specific antibodies, human CD markers were used to characterize swine cells by the expression of the following combination of markers: CD29, CD44, CD49e, CD54, CD63, CD81, CD90, and CD122 (Table 2). 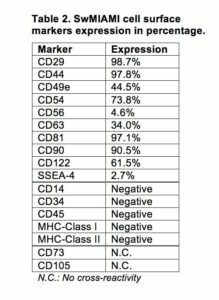 In addition, cells were negative for CD34, CD45, MHC-Class I, and MHC-Class II (Table 2, Figure 3). Furthermore, swMIAMI cells expressed MHC-I only when grown at 21% O2 (Figure 3). Interestingly, only 2.7% of swMIAMI cells express SSEA-4 (Table 2), a stem cell marker highly expressed in hES and human MIAMI cells. No cross-reactivity was observed with swMIAMI cells for CD73 and CD105, antigens that characterize human MSCs (hMSCs). Figure 3. 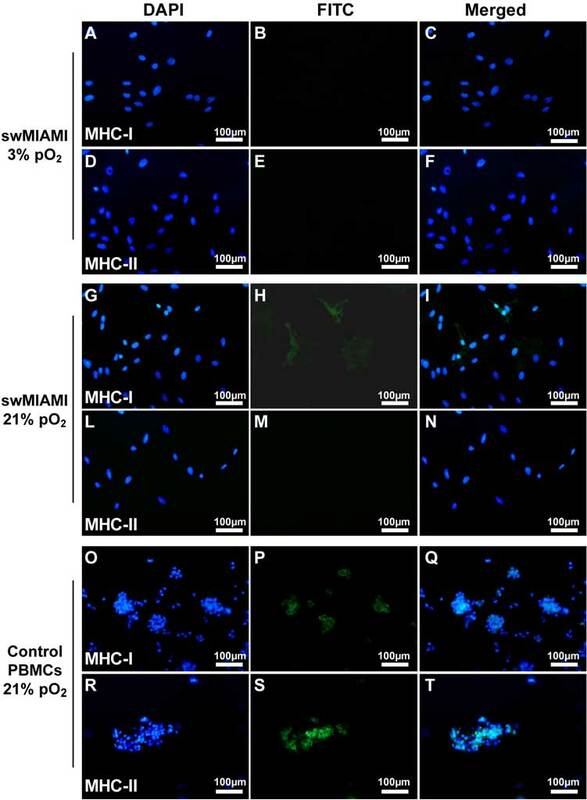 SwMIAMI cells are negative for MHC-I and -II in a low oxygen environment. Immunofluorescence staining of swMIAMI cells against MHC-1 and MHC-II. SwMIAMI cells are negative for MHC-1 & MHC-II at 3% O2 (A-F) and positive for MHC-I at 21% O2 (G-N). Control PBMCs grown in 21% O2 are also shown (O-T). We investigated the multilineage potential of swMIAMI cells by first studying their osteogenic differentiation capacity. SwMIAMI cells cultured at 21% O2 and treated withosteogenic differentiation medium were able to differentiate into bone-forming cells, expressing high levels of osteogenic markers. Cells showed high alkaline phosphataseactivity (Figure 4A) and a significant mineral deposition with the presence of bone nodules after 21 days (Figure 4B). In addition,an increased expression of osteoblastic markers mRNA for osterix,collagen type I (Col1-1a), bone sialoprotein (BSP), alkaline phosphatase (Alk-P), and osteocalcin (OCN), was observed after 7 or/and 14 days of induction (Figure 4C) compared to naïve (non-induced) swMIAMI cells. Figure 4. SwMIAMI cells efficiently differentiate into osteoblasts, chondrocytes and adipocytes. SwMIAMI cells undergoing osteogenic maturation/differentiation were stained for and showed a strong alkaline phosphatase staining at day 7 (A). Extracellular matrix (ECM) calcium deposition was assayed with Alizarin Red-S at day 21, as described in Materials and Methods (B). RT-qPCR analysis demonstrated increased mRNA expression of pro-osteogenic genes after 7 and 14 days of osteogenic differentiation (C). Coll-1α: Collagen, type 1, alpha 1; BSP: Bone sialoprotein; Alk-P: alkaline phosphatase; OCN: osteocalcin. SwMIAMI cells efficiently differentiate into chondrocytes. The data shown are representative of three experiments. Results are expressed as mean ± SD of triplicates. *p < 0.05; **p < 0.01; ***p < 0.001 compared to 21% O2 (set as 1). Histological analysis using Alcian blue staining demonstrated proteoglycan deposition (D). RT-qPCR analysis demonstrated increased aggrecan and collagen type-2 (Coll-2α) mRNA expression after 21 days (E). The data shown are representative of three experiments. Results are expressed as mean ± SD of triplicates. ***p < 0.001 compared to 21% pO2 (set as 1). SwMIAMI cells efficiently differentiate into adipocytes. Oil Red O staining of triglyceride lipid droplets accumulated in the cytoplasm of adipocytic cells derived upon adipocytic induction (see Methods) of swMIAMI cells at day 21 (F). 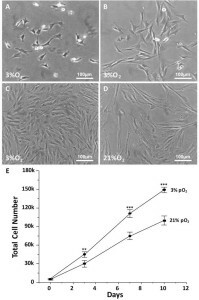 Chondrogenesis differentiation of swMIAMI cells in vitro was assessed after 21 days in cell pellet-culture in the presence of chondrogenic differentiation medium. Histological staining were performed on pellet sections. SwMIAMI cells treated with chondrogenic differentiation medium exhibited a strong Alcian blue staining (Figure 4D), a specific marker of proteoglycan deposition highly expressed in cartilage. 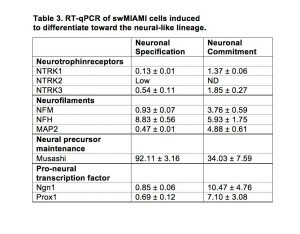 Furthermore, RT-qPCR gene expression analysis demonstrated that swMIAMI cells express higher levels of aggrecan and collagen type-2 after 21 days in culture compared to naïve (non-induced) swMIAMI cells (Figure 4E). Adipogenic differentiation of swMIAMI cells in vitro was assessed after 21 days. At the end of the incubation time, cells showed adipose tissue-forming capacity and accumulated large amounts of triglycerides in their cytoplasm (Figure 4F). 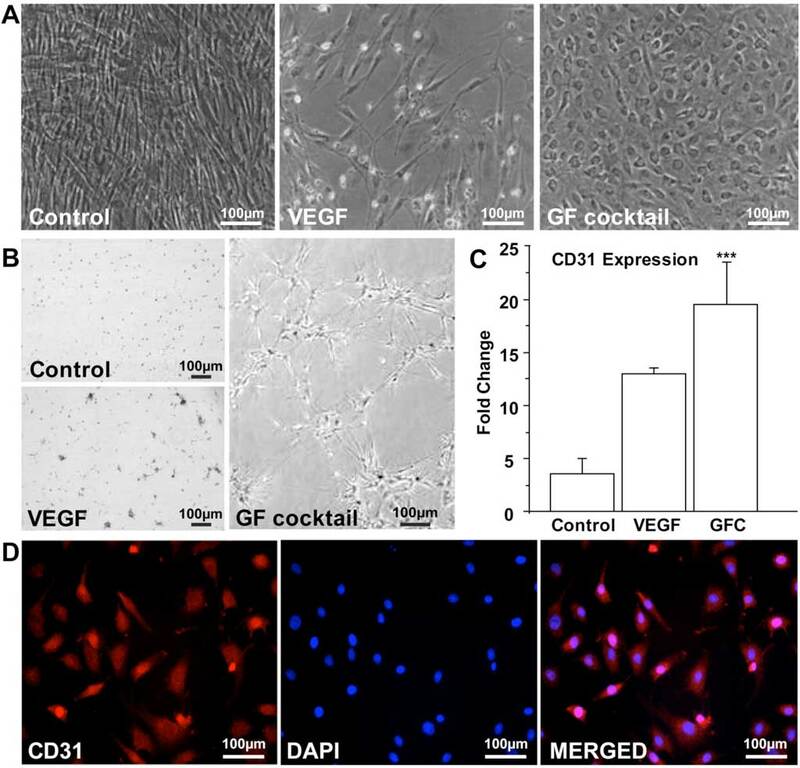 To determine the vascular endothelial differentiation capacity of swMIAMI cells in vitro, cells were plated for 21 days in the presence of VEGF or GFC (see Methods). Control cells, grown in regular expansion medium exhibited the typical spindle shape morphology of swMIAMI cells (Figure 5A, left panel). VEGF-only treated cells were less numerous and were similar in morphology to control cells (Figure 5A, central panel). However, GFC treated cells exhibited a typical epithelioid morphology when confluent (Figure 5A, right panel) 63. The ability of swMIAMI cells to form vascular-like structures in vitro was tested on matrigel in the presence or absence of angiogenic GFC. Vascular tube-like network formation was observed only after 7 days with cells that were pre-treated with the GFC (Figure 5B, right panel). In contrast, no evidence of tubule-like network formation could be observed in untreated cells (Control, Figure 5B, top left panel) or in cells treated with VEGF only (Figure 5B, bottom left panel) for the equivalent periods of time under the culture conditions described. To assess whether swMIAMI cells could differentiate into endothelial-like cells, we performed gene expression analysis in swMIAMI cells treated with GFC. RT-qPCR analysis demonstrated that MIAMI cells in the presence of the angiogenic GFC showed significant up-regulation of CD31 at day 21 compared to control (untreated) cells (Figure 5C). Immunocytochemistry analysis of the endothelial cell marker CD31 was performed on swMIAMI cells in expansion medium (control) or in the presence of GFC. CD31 was strongly detected on day 21 in swMIAMI cells grown in the presence of GFC (Figure 5D). 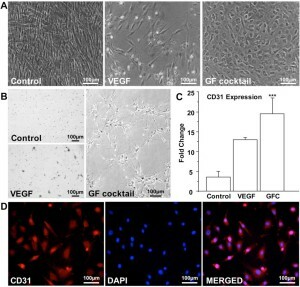 These results suggest that swMIAMI cells are capable of differentiating into endothelial-like cells upon stimulation with angiogenic GFC. Figure 5. 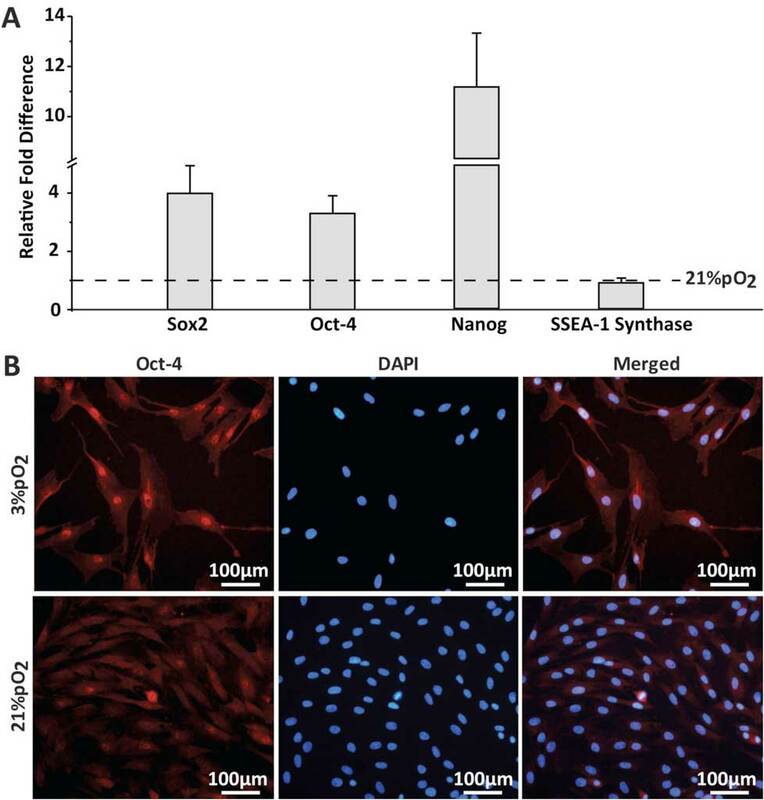 SwMIAMI cells efficiently differentiate into endothelial cells. SwMIAMI cells grown for 21 days in endothelial differentiation medium containing the growth factor cocktail (GFC) demonstrated increased cell numbers and epithelioid morphology (A – right panel) compared to control cells (A – left panel) and vascular endothelial growth factor (VEGF) treated cells (A – middle panel). SwMIAMI cells demonstrated tube-like network formation after 7 days when differentiated in Matrigel in the presence of GFC as compared to control or VEGF treatment (B). RT-qPCR analysis demonstrated increased CD31 mRNA expression in VEGF and GFC treated cells compared to control after 21 days (C). The data shown are representative of three experiments. Results are expressed as mean ± SD of triplicates. p ≤ 0.001 (***) compared to control. Immunocytochemical analysis of swMIAMI cells grown with GFC demonstrated CD31 expression after 21 days (D). Some cells acquired the bipolar spindle shape characteristic of neural cells within 2 h of neural specification (step 1; Figure 6A, left panel; Table 3). After 2 days of neural commitment (step 2), a morphologically homogeneous neural-like cell population was observed (Figure 6A, center panel; Table 3). Finally, at the end of neural differentiation (step 3), cells expressed neurofilament M (NFM) (Figure 6B), while expression of Nestin was not detected, consistent with a mature neural phenotype. The morphology of the neural-induced swMIAMI cells closely resembled that of mature neurons, exhibiting a large number of neurites with significant branching (Figure 6A, right panel white arrows). Figure 6. SwMIAMI cells can be induced to differentiate into neural/neuronal-like cells. (A) Phase contrast microscopy demonstrated increased bipolar spindle-like formation in some cells after neuronal specification (A – left panel; Step 1), with a more homogenous neural-like cell morphology developing after neuronal commitment (A – center panel; Step 2). 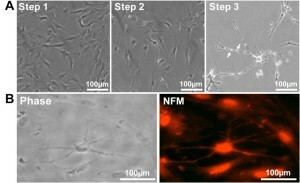 After induction of neural differentiation for 3-7 days, a morphology closely resembling that of mature neurons with increased number of neurite like extensions and branching points was observed (A – right panel; Step 3). Arrows indicate blebbing which are characteristic of mature neurite and axon extensions (A – right panel, arrows). Immunocytochemical analysis of swMIAMI after neural differentiation (Day 7) demonstrated positive staining for neurofilament M (NFM) (B). Human MSCs are currently defined by a combination of physical, morphologic, phenotypic, and functional properties, some of them being considered non-physiologic 64. MSCs are defined by at least the following properties: they are plastic-adherent under standard tissue culture conditions, they express the cell surface non-specific markers CD73, CD90, and CD105, and lack expression (≤2% positive) of CD45, CD34, CD14 or CD11b, CD79α or CD19 and HLA class II. Finally, the cells must be able to differentiate into osteoblasts, adipocytes, and chondrocytes under standard in vitro differentiation conditions 65. These criteria are not fully applicable to other species, such as swine, since their surface antigen expression is not yet well-characterized 66. 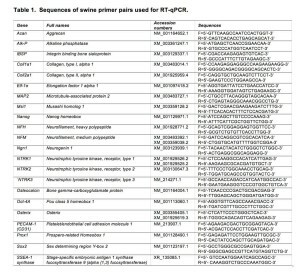 Therefore, characterizing swine derived cells (as for other species) is more complicated, even though some anti-human antibodies can cross-react with swine epitopes 67. In this study, we demonstrated that MIAMI cells, a sub population of MSCs 68, can be characterized in swine by the expression of CD markers represented in Table 2 and by the expression of pluripotency and stem cell markers, including Nanog, Sox-2, Oct-4, and SSEA-1. These classic human and mouse ES cell markers are indeed expressed by ungulate inner cell mass (ICM) and embryo-derived cell lines 69. In swine embryo development, the pluripotency of the epiblast is maintained by the expression of Oct-4, Nanog, and Sox-2 70 , 71, even though, and in opposition to human ESCs, Nanog is the key parameter in maintaining pluripotency while Oct4 plays only a more limited role 72. Noteworthy, no validated swine ES cells (swESCs) have been described yet 73; partly because embryonic development in swine is fundamentally different from both humans and mice 74. Different research groups have attempted to isolate swESCs 75 , 76 , 77; however, none of them were able to generate an ES cell line with the same totipotent characteristics of human or mouse. Hence, although the isolated cells have some stem cell characteristic, they are described as stem cell-like. To our knowledge, swMIAMI cells are the only bone marrow cells derived from swine expressing the three fundamental genes Oct-4, Nanog, and Sox-2, while for example, swMAPCs only express Oct-4, but neither Nanog nor Sox-2 78. In addition, 2.7% of swMIAMI cells express SSEA-4, known to be expressed at similar low levels in swine epiblasts 79 62, while not usually expressed in swMSCs 80. However, SSEA-4 in swine is not regarded as a definitive ES marker as noted by Brevini et al 81, unlike in human ES cells where it is highly expressed 82. SSEA-1 was also expressed in swMIAMI cells, similar to what is described in cells from early swine epiblasts 83 or in swine iPS cells 84; and as well as in murine ES cells 85. This is in contrast with a recent report that reported SSEA-1 was essentially undetected in swMSCs 86. These same authors did not report on the presence of SSEA-4 due to not having a (human-swine) cross-reactive antibody 87. Taken together, this data on the expression of stem cell markers Oct-4, Nanog, Sox-2, and SSEA-1, supports the idea of the immature status of swMIAMI cells, as seen in human MIAMI cells 88. We observed that during osteoblastic differentiation, swMIAMI exhibit some calcium deposition in the extracellular matrix as early as after 10-14 days whereas it takes at least 28 days in human MIAMI cells 89. In addition, adipocyte differentiation was clearly animal/donor dependent. SwMIAMI cells were able to differentiate into adipocytes within the same time-frame as human cells, but not all donors responded equally to the adipogenic differentiation. In addition, we did not see differences between swMIAMI cells and human MIAMI cells in their differentiation toward chondrocytes, neuronal, or endothelial-like cells. Since bearing a similar anatomy and physiology than humans 90 , 91, a swine animal model is particularly suitable to address certain basic biological properties and multiple questions of clinical relevance of MIAMI cells. Therefore, successful isolation, characterization and in vitro differentiation of swMIAMI cells into multilineages will provide additional support for developing and standardizing therapeutic strategies for human applications. The use of large animal models in transplantation for pre-clinical studies, such as swine is central to understand the cell dosage, cell survival, inflammatory and immunological responses to engraftment 92. In view of the potential application of swMIAMI cells in an experimental model of solid organ transplantation with the aim of facilitating graft acceptance, in vitro characterization of these cells and demonstration of their similarity to human cells represents a fundamental prerequisite 93. Moreover, studies in a swine model may offer a significant contribution in the translation of cellular therapy strategies to the clinical setting. In vivo tracking studies to examine the survival, distribution, and homing of swMIAMI cells after infusion in large animal models should permit us to optimize the clinical use of swMIAMI cells to promote tolerance induction in solid organ transplantation patients. In this study we describe the isolation and characterization of MIAMI cells from swine bone marrow which shared the hallmarks of their human counterparts. Morphologically, swMIAMI cells appeared similar to the human cells, small in size with a little cytoplasm 94. SwMIAMI cells rapidly and extensively proliferate in vitro and express embryonic stem cell markers Oct4a, Sox-2, Nanog, and SSEA-1. SwMIAMI cells were able to differentiate in vitro into osteoblasts, chondrocytes, adipocytes, endothelial-like, and neuronal-like cells. Moreover, as already demonstrated with human cells, oxygen tension played an important role in maintaining cells in a more immature state. Embryonic stem cell markers involved in cell renewal were indeed expressed at significantly higher levels in cells grown at 3% O2 compared to cells grown at 21% O2. Our results show that there are many similarities between swine and human MIAMI cells, and hence swMIAMI cells should be considered as a valuable preclinical model. Department of Veterans Affairs, Veterans Health Administration, Office of Research and Development (Biomedical Laboratory Research and Development) Merit Review award (BX000952) to Dr. Paul C. Schiller. Sensebe L, Bourin P. Mesenchymal stem cells for therapeutic purposes. Transplantation 2009; 87(9 Suppl): S49-53. Herzog EL, Chai L, Krause DS. Plasticity of marrow-derived stem cells. Blood 2003; 102(10): 3483-3493. Friedenstein AJ, Chailakhjan RK, Lalykina KS. The development of fibroblast colonies in monolayer cultures of guinea-pig bone marrow and spleen cells. Cell Tissue Kinet 1970; 3(4): 393-403. Pittenger MF, Mackay AM, Beck SC, Jaiswal RK, Douglas R, Mosca JD, et al. Multilineage potential of adult human mesenchymal stem cells. Science 1999; 284(5411): 143-147. Kuznetsov SA, Krebsbach PH, Satomura K, Kerr J, Riminucci M, Benayahu D, et al. Single-colony derived strains of human marrow stromal fibroblasts form bone after transplantation in vivo. J Bone Miner Res 1997; 12(9): 1335-1347. Aubin JE. Bone stem cells. J Cell Biochem Suppl 1998; 30-31: 73-82. Bennett JH, Joyner CJ, Triffitt JT, Owen ME. 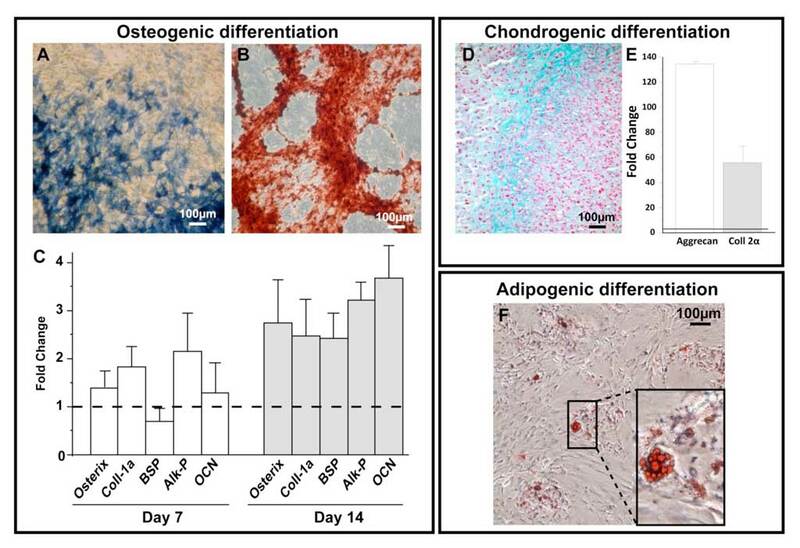 Adipocytic cells cultured from marrow have osteogenic potential. J Cell Sci 1991; 99( Pt 1): 131-139. Conget PA, Minguell JJ. Phenotypical and functional properties of human bone marrow mesenchymal progenitor cells. J Cell Physiol 1999; 181(1): 67-73. Tao XR, Li WL, Su J, Jin CX, Wang XM, Li JX, et al. Clonal mesenchymal stem cells derived from human bone marrow can differentiate into hepatocyte-like cells in injured livers of SCID mice. J Cell Biochem 2009; 108(3): 693-704. Zhao LR, Duan WM, Reyes M, Keene CD, Verfaillie CM, Low WC. Human bone marrow stem cells exhibit neural phenotypes and ameliorate neurological deficits after grafting into the ischemic brain of rats. Exp Neurol 2002; 174(1): 11-20. Uccelli A, Moretta L, Pistoia V. Immunoregulatory function of mesenchymal stem cells. Eur J Immunol 2006; 36(10): 2566-2573. Trivedi LH, Vanikar AV, Kute VB, Patel HV, Gumber RM, Shah PR, Dave SD. Pretransplant infusion of donor stem cells open gateway to tolerance through induction of regulatory T cells and activation of other allosuppressive immune mechanisms–Single centre experience in living donor renal transplantation. CellR4 2013; 1(3): 528. Cohnheim JF. Über Entzündung und Eiterung. J Arch Path Ant Physiol Klin Med 1867; 40: 1-79. Kumar S, Chanda D, Ponnazhagan S. Therapeutic potential of genetically modified mesenchymal stem cells. Gene Ther 2008; 15(10): 711-715. D’Ippolito G, Schiller PC, Ricordi C, Roos BA, Howard GA. Age-related osteogenic potential of mesenchymal stromal stem cells from human vertebral bone marrow. J Bone Miner Res 1999; 14(7): 1115-1122. Devine SM, Bartholomew AM, Mahmud N, Nelson M, Patil S, Hardy W, et al. Mesenchymal stem cells are capable of homing to the bone marrow of non-human primates following systemic infusion. Exp Hematol 2001; 29(2): 244-255. Zhang L, Chan C. Isolation and enrichment of rat mesenchymal stem cells (MSCs) and separation of single-colony derived MSCs. J Vis Exp 2010 Mar 22; (37). pii: 1852. doi: 10.3791/1852. Soleimani M, Nadri S. A protocol for isolation and culture of mesenchymal stem cells from mouse bone marrow. Nat Protoc 2009; 4(1): 102-106. Huss R, Hoy CA, Deeg HJ. Contact- and growth factor-dependent survival in a canine marrow-derived stromal cell line. Blood 1995; 85(9): 2414-2421. Planka L, Gal P, Kecova H, Klima J, Hlucilova J, Filova E, et al. Allogeneic and autogenous transplantations of MSCs in treatment of the physeal bone bridge in rabbits. BMC Biotechnol 2008; 8: 70. Martin DR, Cox NR, Hathcock TL, Niemeyer GP, Baker HJ. Isolation and characterization of multipotential mesenchymal stem cells from feline bone marrow. Exp Hematol 2002; 30(8): 879-886. Ringe J, Kaps C, Schmitt B, Buscher K, Bartel J, Smolian H, et al. Porcine mesenchymal stem cells. Induction of distinct mesenchymal cell lineages. Cell Tissue Res 2002; 307(3): 321-327. Mrugala D, Bony C, Neves N, Caillot L, Fabre S, Moukoko D, et al. Phenotypic and functional characterisation of ovine mesenchymal stem cells: application to a cartilage defect model. Ann Rheum Dis 2008; 67(3): 288-295. Murphy JM, Fink DJ, Hunziker EB, Barry FP. Stem cell therapy in a caprine model of osteoarthritis. Arthritis Rheum 2003; 48(12): 3464-3474. Bosnakovski D, Mizuno M, Kim G, Takagi S, Okumura M, Fujinaga T. Isolation and multilineage differentiation of bovine bone marrow mesenchymal stem cells. Cell Tissue Res 2005; 319(2): 243-253. Liu Y, Liu Y, Yie S, Lan J, Pi J, Zhang Z, et al. Characteristics of mesenchymal stem cells isolated from bone marrow of giant panda. Stem Cells Dev 2013; 22(17): 2394-2401. Colleoni S, Bottani E, Tessaro I, Mari G, Merlo B, Romagnoli N, et al. Isolation, growth and differentiation of equine mesenchymal stem cells: effect of donor, source, amount of tissue and supplementation with basic fibroblast growth factor. Vet Res Commun 2009; 33(8): 811-821. Ho AD, Wagner W, Franke W. Heterogeneity of mesenchymal stromal cell preparations. Cytotherapy 2008; 10(4): 320-330. Dominici M, Paolucci P, Conte P, Horwitz EM. Heterogeneity of multipotent mesenchymal stromal cells: from stromal cells to stem cells and vice versa. Transplantation 2009; 87(9 Suppl): S36-42. Dominici M, Le Blanc K, Mueller I, Slaper-Cortenbach I, Marini F, Krause D, et al. Minimal criteria for defining multipotent mesenchymal stromal cells. The International Society for Cellular Therapy position statement. Cytotherapy 2006; 8(4): 315-317. Le Blanc K, Mougiakakos D. Multipotent mesenchymal stromal cells and the innate immune system. Nat Rev Immunol 2012; 12(5): 383-396. D’Ippolito G, Diabira S, Howard GA, Menei P, Roos BA, Schiller PC. Marrow-isolated adult multilineage inducible (MIAMI) cells, a unique population of postnatal young and old human cells with extensive expansion and differentiation potential. J Cell Sci 2004; 117(Pt 14): 2971-2981. D’Ippolito G, Diabira S, Howard GA, Roos BA, Schiller PC. Low oxygen tension inhibits osteogenic differentiation and enhances stemness of human MIAMI cells. Bone 2006; 39(3): 513-522. Delcroix GJ, Garbayo E, Sindji L, Thomas O, Vanpouille-Box C, Schiller PC, et al. The therapeutic potential of human multipotent mesenchymal stromal cells combined with pharmacologically active microcarriers transplanted in hemi-parkinsonian rats. Biomaterials 2011; 32(6): 1560-1573. Garbayo E, Raval AP, Curtis KM, Della-Morte D, Gomez LA, D’Ippolito G, et al. 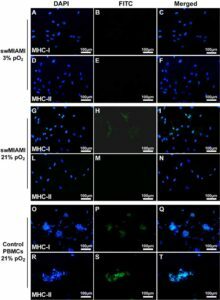 Neuroprotective properties of marrow-isolated adult multilineage-inducible cells in rat hippocampus following global cerebral ischemia are enhanced when complexed to biomimetic microcarriers. J Neurochem 2011; 119(5): 972-988. Rahnemai-Azar A, D’Ippolito G, Gomez LA, Reiner T, Vazquez-Padron RI, Perez-Stable C, et al. Human marrow-isolated adult multilineage-inducible (MIAMI) cells protect against peripheral vascular ischemia in a mouse model. Cytotherapy 2011; 13(2): 179-192. Horn PA, Morris JC, Neff T, Kiem HP. Stem cell gene transfer–efficacy and safety in large animal studies. Mol Ther 2004; 10(3): 417-431. Janssens S, Dubois C, Bogaert J, Theunissen K, Deroose C, Desmet W, et al. Autologous bone marrow-derived stem-cell transfer in patients with ST-segment elevation myocardial infarction: double-blind, randomised controlled trial. Lancet 2006; 367(9505): 113-121. Orlic D, Kajstura J, Chimenti S, Jakoniuk I, Anderson SM, Li B, et al. Bone marrow cells regenerate infarcted myocardium. Nature 2001; 410(6829): 701-705. Sachs DH. The pig as a potential xenograft donor. Vet Immunol Immunopathol 1994; 43(1-3): 185-191. Gavenis K, Heussen N, Hofman M, Andereya S, Schneider U, Schmidt-Rohlfing B. Cell-free repair of small cartilage defects in the Goettinger minipig: The effects of BMP-7 continuously released by poly(lactic-co-glycolid acid) microspheres. J Biomater Appl 2014; 28(7): 1008-1015. Jung M, Kaszap B, Redohl A, Steck E, Breusch S, Richter W, et al. Enhanced early tissue regeneration after matrix-assisted autologous mesenchymal stem cell transplantation in full thickness chondral defects in a minipig model. Cell Transplant 2009; 18(8): 923-932. Gotterbarm T, Breusch SJ, Schneider U, Jung M. The minipig model for experimental chondral and osteochondral defect repair in tissue engineering: retrospective analysis of 180 defects. Lab Anim 2008; 42(1): 71-82. Yang X, Tian XC, Dai Y, Wang B. Transgenic farm animals: applications in agriculture and biomedicine. Biotechnol Annu Rev 2000; 5: 269-292. Aleem Khan A, Parveen N, Habeeb MA, Habibullah CM. Journey from hepatocyte transplantation to hepatic stem cells: a novel treatment strategy for liver diseases. Indian J Med Res 2006; 123(5): 601-614. Guide for the Care and Use of Laboratory Animals, 8th edition, National Research Council (US) Committee for the Update of the Guide for the Care and Use of Laboratory Animals. Washington (DC): National Academies Press (US), 2011. Pfaffl MW. A new mathematical model for relative quantification in real-time RT-PCR. Nucleic Acids Res 2001; 29(9): e45. Schiller PC, D’Ippolito G, Brambilla R, Roos BA, Howard GA. Inhibition of gap-junctional communication induces the trans-differentiation of osteoblasts to an adipocytic phenotype in vitro. J Biol Chem 2001; 276(17): 14133-14138. Huang CY, Reuben PM, D’Ippolito G, Schiller PC, Cheung HS. Chondrogenesis of human bone marrow-derived mesenchymal stem cells in agarose culture. Anat Rec A Discov Mol Cell Evol Biol 2004; 278(1): 428-436. Delcroix GJ, Curtis KM, Schiller PC, Montero-Menei CN. EGF and bFGF pre-treatment enhances neural specification and the response to neuronal commitment of MIAMI cells. Differentiation 2010; 80(4-5): 213-227. Dejana E. Endothelial cell-cell junctions: happy together. Nat Rev Mol Cell Biol 2004; 5(4): 261-270. Javazon EH, Beggs KJ, Flake AW. Mesenchymal stem cells: paradoxes of passaging. Exp Hematol 2004; 32(5): 414-425. Bosch P, Pratt SL, Stice SL. Isolation, characterization, gene modification, and nuclear reprogramming of porcine mesenchymal stem cells. Biol Reprod 2006; 74(1): 46-57. Rozemuller H, Prins HJ, Naaijkens B, Staal J, Buhring HJ, Martens AC. Prospective isolation of mesenchymal stem cells from multiple mammalian species using cross-reacting anti-human monoclonal antibodies. Stem Cells Dev 2010; 19(12): 1911-1921. Brevini TA, Pennarossa G, Gandolfi F. No shortcuts to pig embryonic stem cells. Theriogenology 2010; 74(4): 544-550. Brevini TA, Antonini S, Cillo F, Crestan M, Gandolfi F. Porcine embryonic stem cells: Facts, challenges and hopes. Theriogenology 2007; 68 Suppl 1: S206-213. Brevini TA, Tosetti V, Crestan M, Antonini S, Gandolfi F. Derivation and characterization of pluripotent cell lines from pig embryos of different origins. Theriogenology 2007; 67(1): 54-63. Oestrup O, Hall V, Petkov SG, Wolf XA, Hyldig S, Hyttel P. From zygote to implantation: morphological and molecular dynamics during embryo development in the pig. Reprod Domest Anim 2009; 44 Suppl 3: 39-49. Hall VJ, Christensen J, Gao Y, Schmidt MH, Hyttel P. Porcine pluripotency cell signaling develops from the inner cell mass to the epiblast during early development. Dev Dyn 2009; 238(8): 2014-2024. Keefer CL, Pant D, Blomberg L, Talbot NC. Challenges and prospects for the establishment of embryonic stem cell lines of domesticated ungulates. Anim Reprod Sci 2007; 98(1-2): 147-168. Zeng L, Rahrmann E, Hu Q, Lund T, Sandquist L, Felten M, et al. Multipotent adult progenitor cells from swine bone marrow. Stem Cells 2006; 24(11): 2355-2366. Alberio R, Croxall N, Allegrucci C. Pig Epiblast stem cells depend on activin/nodal signaling for pluripotency and self-renewal. Stem Cells Dev 2010; 19(10): 1627-1636. Noort WA, Oerlemans MI, Rozemuller H, Feyen D, Jaksani S, Stecher D, et al. Human versus porcine mesenchymal stromal cells: phenotype, differentiation potential, immunomodulation and cardiac improvement after transplantation. J Cell Mol Med 2012; 16(8): 1827-1839. Henderson JK, Draper JS, Baillie HS, Fishel S, Thomson JA, Moore H, et al. Preimplantation human embryos and embryonic stem cells show comparable expression of stage-specific embryonic antigens. Stem Cells 2002; 20(4): 329-237. Rodriguez A, Allegrucci C, Alberio R. Modulation of pluripotency in the porcine embryo and iPS cells. PLoS One 2012; 7(11): e49079. Cui L, Johkura K, Yue F, Ogiwara N, Okouchi Y, Asanuma K, et al. Spatial distribution and initial changes of SSEA-1 and other cell adhesion-related molecules on mouse embryonic stem cells before and during differentiation. J Histochem Cytochem 2004; 52(11): 1447-1457. Cozzi E, Tucker AW, Langford GA, Pino-Chavez G, Wright L, O’Connell MJ, et al. Characterization of pigs transgenic for human decay-accelerating factor. Transplantation 1997; 64(10): 1383-1392. Ibrahim Z, Busch J, Awwad M, Wagner R, Wells K, Cooper DK. Selected physiologic compatibilities and incompatibilities between human and porcine organ systems. Xenotransplantation 2006; 13(6): 488-499. Comite P, Cobianchi L, Avanzini MA, Zonta S, Mantelli M, Achille V, et al. 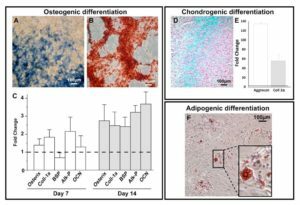 Isolation and ex vivo expansion of bone marrow-derived porcine mesenchymal stromal cells: potential for application in an experimental model of solid organ transplantation in large animals. Transplant Proc 2010; 42(4): 1341-1343. Trivedi HL, Vanikar AV. Mesenchymal stem cells and solid organ transplantation. CellR4 2013; 1(2): 377.